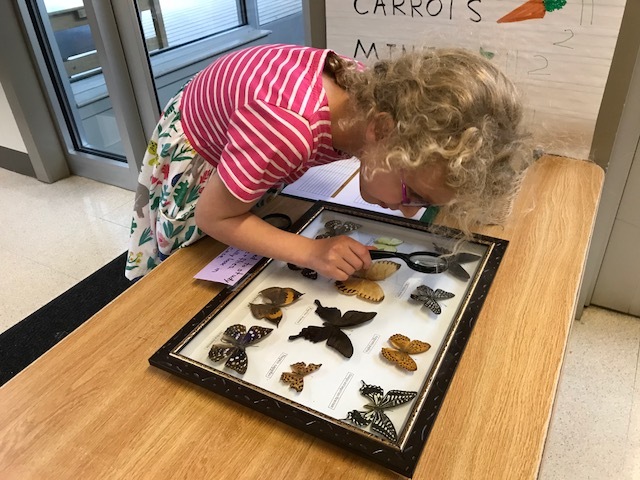 Preschool B has turned its attention to butterflies. As we began our research on butterflies, Jonah led us in a math lesson that talked about “symmetry.” We pretended our rug was a giant butterfly and used rubber marker spots to decorate the wings. The children worked in teams to create a beautiful and symmetrical floor butterfly. At the art table, each child made their own butterfly by dripping paint onto a paper cutout, folding it in half, and then running rollers over the entire thing. When the paper was then unfolded, voila!